Those who suffer from excessive sweating have a hard time at both social and business interactions. Having to go to the doctor’s office regularly to receive treatment doesn’t give those with excessive sweating any peace of mind. Iontophoresis machines are available to the public at affordable prices, and best of all, they are used at home. Iontophoresis machines provide regular treatment without the cost with every treatment. When it comes to iontophoresis machines though there always seems to be a new one entering the market, which one is the right one? 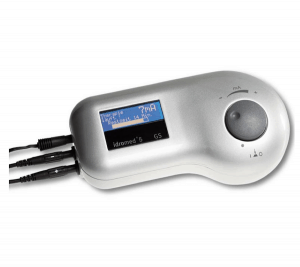 The Idromed 5 PS is one of the latest and best iontophoresis machines with pulsed current. It has lots of 5-star reviews from its users and provides you with all of the features that you would expect from such a machine. The Idromed 5 PS comes in a sleek box that holds all of the components necessary. When you open the box you will find a sleek control unit that features a LCD screen. A dial allows you to set the proper treatment strength. One cable connects the unit to the treatment area, a second cable provides power to the unit. The case, when fully opened holds the water and acts as the treatment reservoir. With this reservoir you can treat both the hands and the feet. There are several versions of the Idromed iontophoresis machine such the Idromed PC, Idromed 5PS, Idromed 5DC. Each version is designed to treat different areas. The most obvious treatment areas are the hands and the feet. You can also get units to treat the face, neck, groin, thighs, underarms, and buttocks. With all of these options you can treat an area that excessive sweating might find. Think about the magnificence of having a unit that is capable of treating your excessive sweating so that you can feel more confident in your everyday life. No longer will you have to worry if people are noticing your sweating. A handshake is once again a thing of confidence. Plus, it is hard to argue with the 5-star reviews that the unit has received from real customers. You can purchase the Idromed 5 PC and Idormed 5 DC from a EU or a US webshop. Right now you can probably get a better deal at the EU webshop as a consequence of the exchange rates at the time of writing this (675EUR = $710).